Create a new Google Ads search campaign in HubSpot's legacy ads add-on. In your HubSpot account, navigate to Marketing > Ads. In the upper right, click the Create ad campaign dropdown menu and select Google Ads search campaign. If you have multiple Google Ads accounts connected to HubSpot, click the Select Google Ads account dropdown menu and select an account. 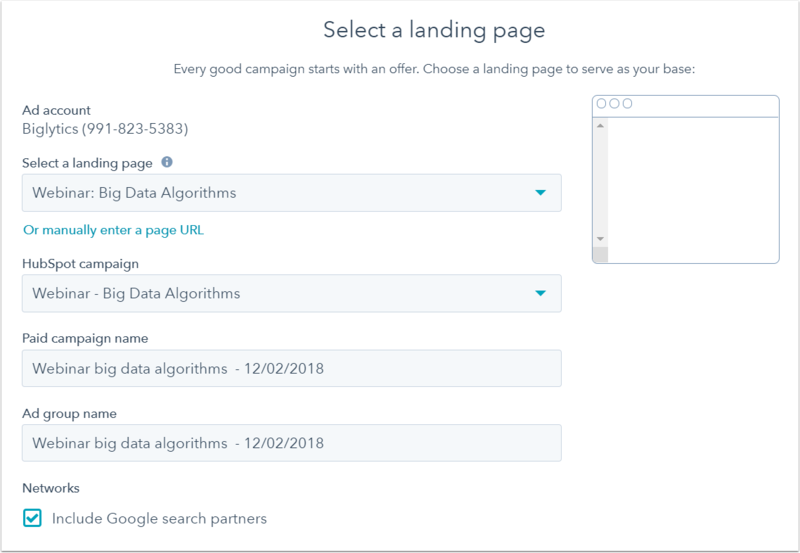 Click the Select a landing page dropdown menu and select the HubSpot landing page you want to base your search campaign on. If you want to use an external landing page, click Or manually enter a page URL, then input the URL and click Select. Click the Select or create campaign dropdown menu and select a HubSpot campaign or click Create new HubSpot campaign. Enter a Paid campaign name and Ad group name. To include Google search partners, select the Include Google search partners checkbox. In the bottom right, click Next. Review your ad and make changes as needed. To add a new keyword, enter a keyword in the Keyword field and click Add. To remove an existing keyword, hover over the keyword and click Remove. To set a match type for a keyword, click the dropdown menu and select Exact match, Phrase match, or Broad match. Click Add a location to add a location to target for your search campaign. (Optional) To edit a bid adjustment for a location, in the Bid adjustment column, click the pencil icon edit. In the dialog box, enter a percentage increase or decrease on the bid for searches from this location. Set your Maximum cost per click and Daily budget. Click Need help calculating your bid? 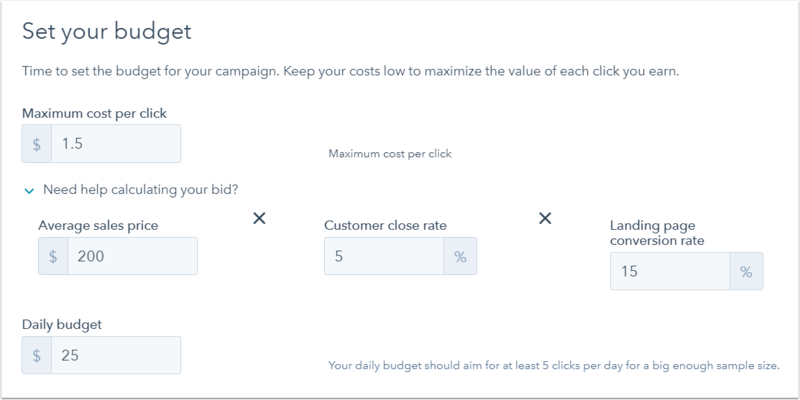 to input your average sales price, customer close rate, and landing page conversion rate to calculate an appropriate cost per click and daily budget. Review your Google Ads search campaign. To make changes to a setting, click Edit. To create the search campaign, click Done. 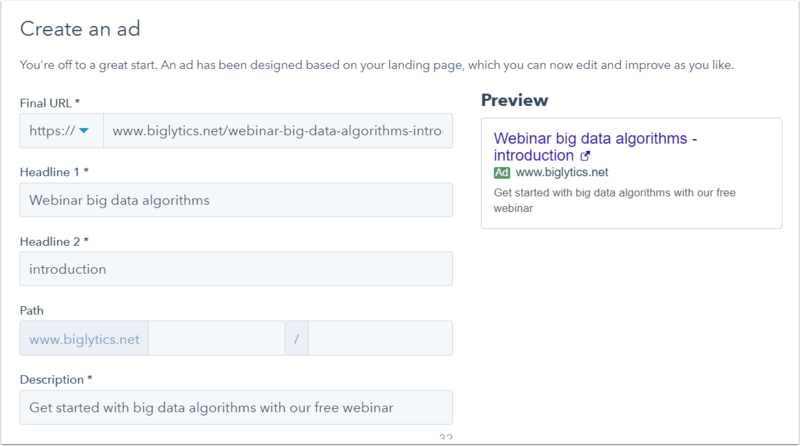 Learn how to analyze your ads campaigns in the ads dashboard in HubSpot.